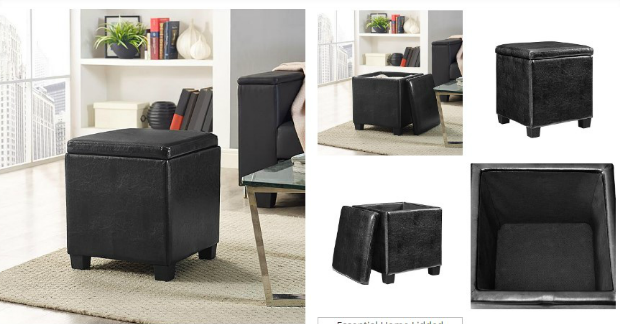 Essential Home Lidded Storage Ottoman Just $17.99 At Kmart! You are here: Home / Great Deals / Essential Home Lidded Storage Ottoman Just $17.99 At Kmart! Right now you can get this Essential Home Lidded Storage Ottoman for only $17.99 at Kmart! Down from $40.00! Class up your space with this storage ottoman from Essential Home. Smooth synthetic leather offers a sharp addition to your decor, while a cushioned lid gives you a comfortable place to prop up your feet after a long day. Inside, ample storage space lets you get magazines, throws or games off the ground, keeping your house tidy and stylish.